Searching for "data for decision makers"
Mapbox is a versatile mapping platform that allows users to build maps and apps. 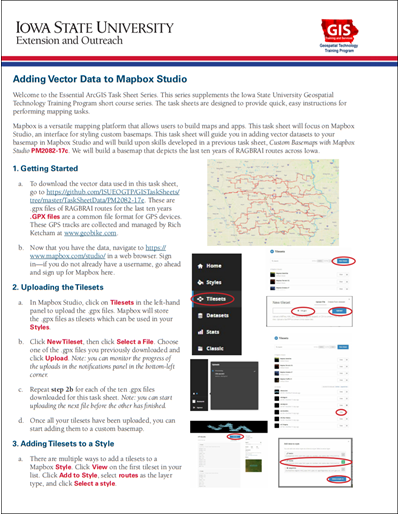 This task sheet will focus on Mapbox Studio, an interface for styling custom basemaps. This task sheet will build upon skills developed in a previous task sheet, Custom Basemaps with Mapbox Studio. 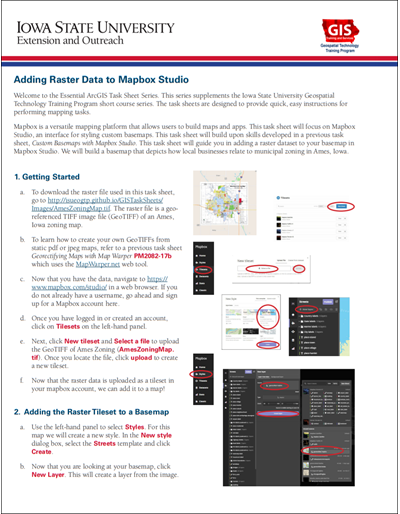 This task sheet will guide you in adding a raster dataset to your basemap in Mapbox Studio. 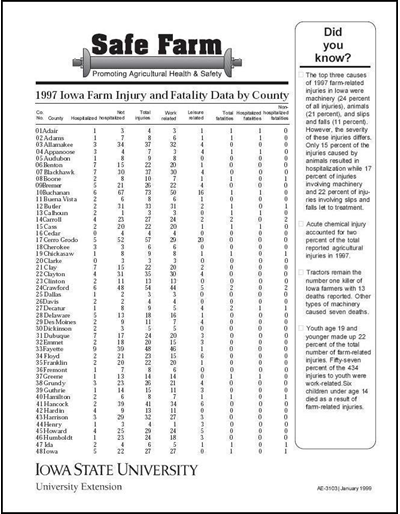 We will build a basemap that depicts how local businesses relate to municipal zoning in Ames, Iowa. Geojson.io is a quick, simple tool for creating, viewing and sharing maps. 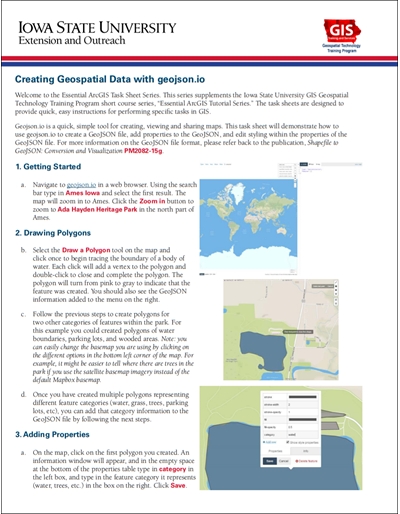 This task sheet will demonstrate how to use geojson.io to create a GeoJSON file, add properties to the GeoJSON, and edit styling within the properties of the GeoJSON file. 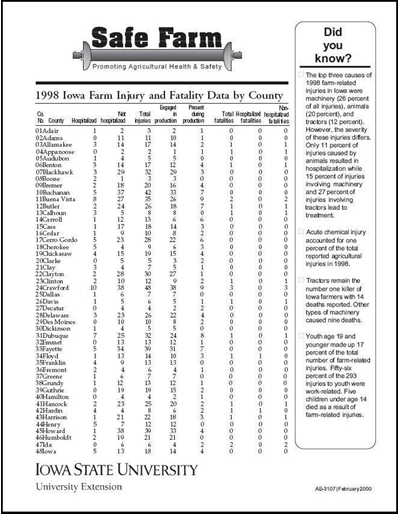 For more information on the GeoJSON file format, please refer to the publication, Shapefile to GeoJSON: Conversion and Visualization PM 2082-15G. 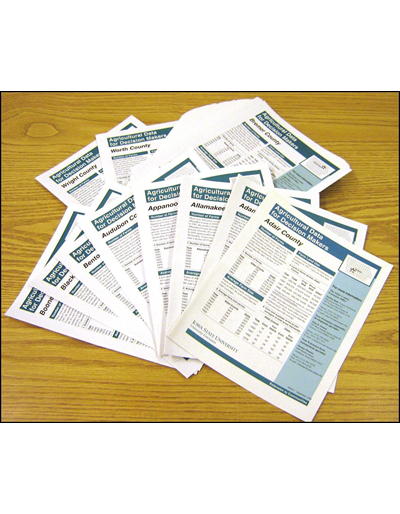 The U.S. Census Bureau provides many different datasets on topics such as population, demographics, housing and income. 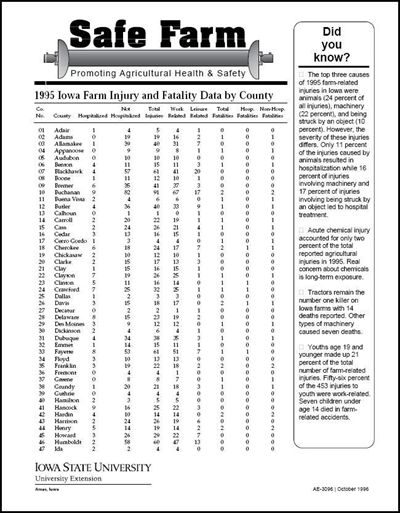 The American Fact Finder website allows users to find and download data collected through the decennial census and other surveys. 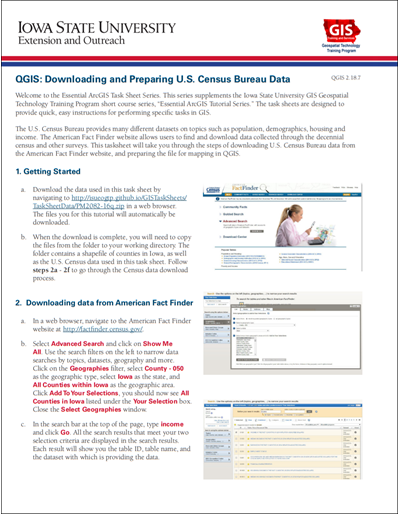 This task sheet will take you through the steps of downloading U.S. Census Bureau data from the American Fact Finder website and preparing the file for mapping in QGIS. 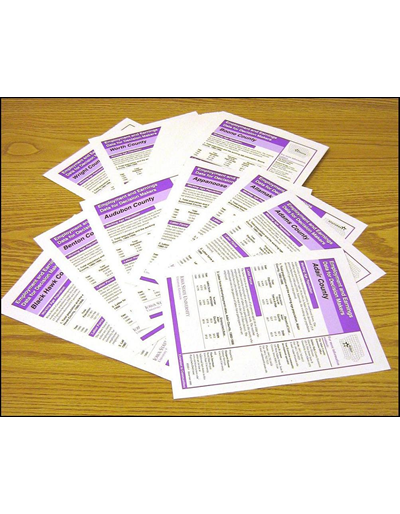 The U.S. Census Bureau provides many different datasets on topics such as population, and demographics. 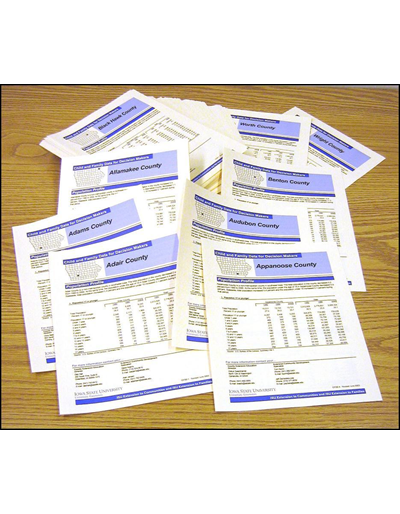 The American Community Survey (ACS) is a nationwide survey carried out by the U.S. Census Bureau that measures and describes the social, economic, housing, and demographic characteristics of the U.S. population, including states, regions, counties, and local areas. 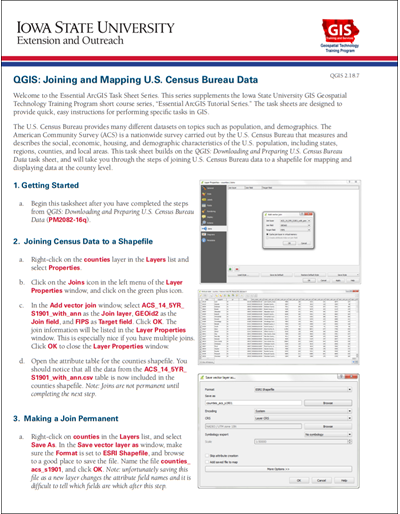 This task sheet builds on the QGIS: Downloading and Preparing U.S. Census Bureau Data task sheet and will take you through the steps of joining U.S. Census Bureau data to a shapefile for mapping and displaying data at the county level. 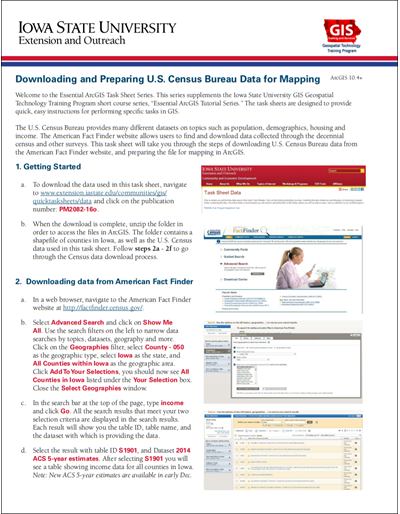 This task sheet will take you through the steps of downloading U.S. Census Bureau data from the American Fact Finder website and preparing the file for mapping in ArcGIS. 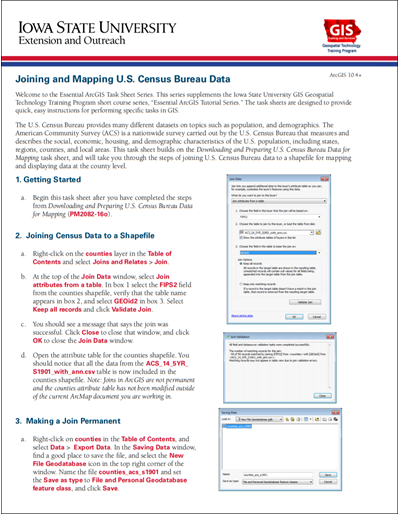 This task sheet builds on the Downloading and Preparing U.S. Census Bureau Data for Mapping task sheet and will take you through the steps of joining U.S. Census Bureau data to a shapefile for mapping and displaying data at the county level. 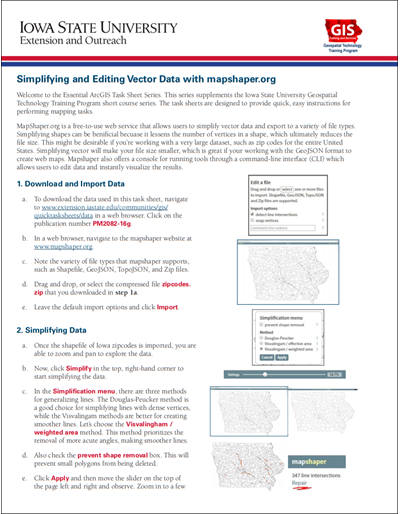 MapShaper.org is a free-to-use web service that allows users to simplify vector data and export to a variety of file types. Simplifying shapes can be beneficial because it lessens the number of vertices in a shape, which ultimately reduces the file size. This might be desirable if you’re working with a very large dataset, such as zip codes for the entire United States. Simplifying vector will make your file size smaller, which is great if you’re working with the GeoJSON format to create web maps. Mapshaper also offers a console for running tools through a command-line interface (CLI) which allows users to edit data and instantly visualize the results. 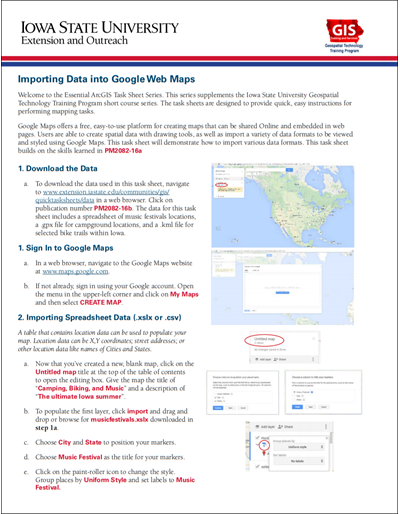 Google Maps offers a free, easy-to-use platform for creating maps that can be shared Online and embedded in web pages. Users can create spatial data with drawing tools, as well as import a variety of data formats to be viewed and styled using Google Maps. 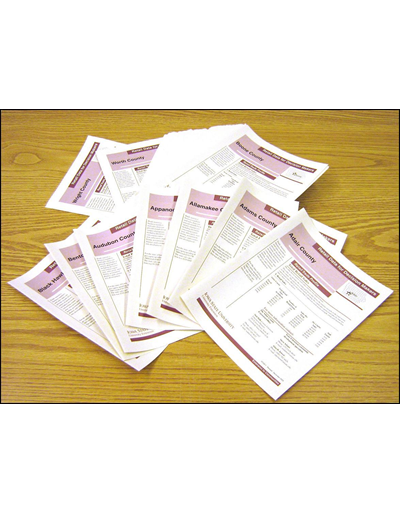 This task sheet will demonstrate how to import various data formats. This task sheet builds on the skills learned in PM 2082-16A. 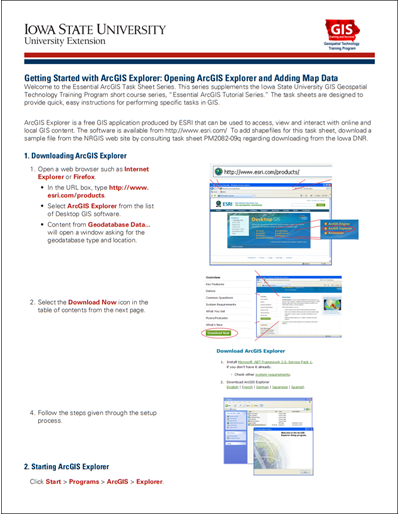 The Data Interoperability extension tool, Quick Import, converts any data source supported by the Data Interoperability extension (http://www.esri.com/software/arcgis/extensions/datainteroperability/supported-formats) and loads it into a geodatabase. 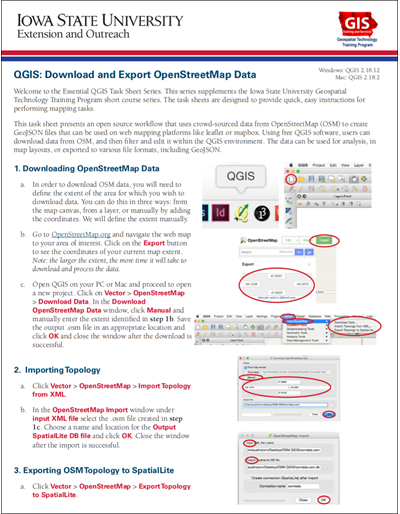 The Quick Export tool converts geodatabase feature classes or feature layers to any external dataset supported by the Data Interoperability extension. 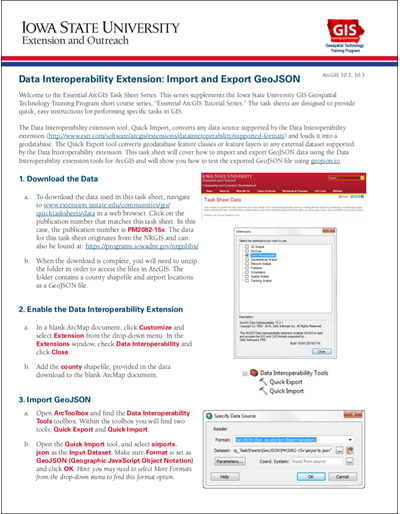 This task sheet will cover how to import and export GeoJSON data using the Data Interoperability extension tools for ArcGIS and will show you how to test the exported GeoJSON file using geojson.io. 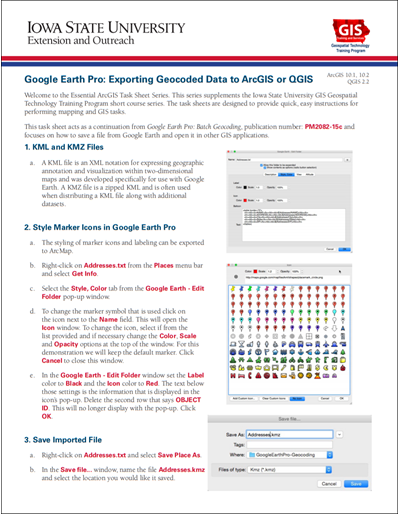 This task sheet acts as a continuation from Google Earth Pro: Batch Geocoding, publication number: PM2082-15C and focuses on how to save a file from Google Earth and open it in other GIS applications. 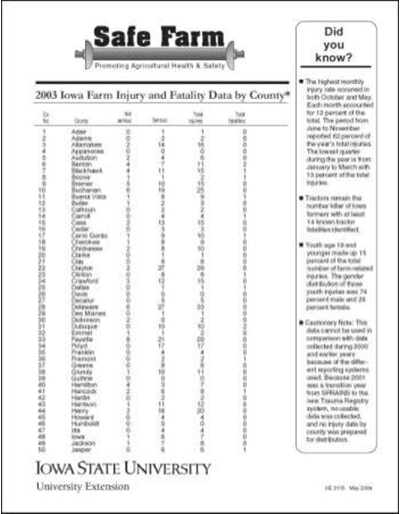 The ISU Farm Bill Analyzer is an educational tool to help Iowa corn and soybean farmers make informed decisions regarding the reallocation of base acres and election of a commodity program for the life of the Farm Bill. 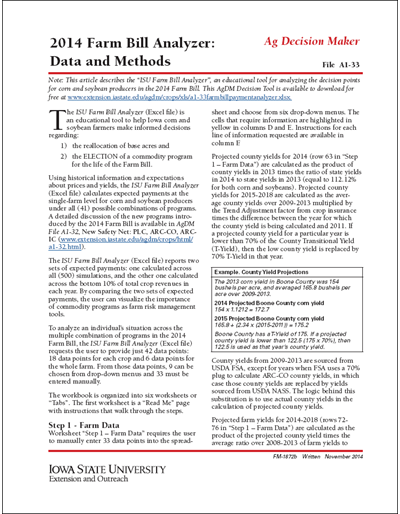 Download the ISU Farm Bill Analyzer, an Excel spreadsheet, from the Ag Decision Maker website for analyzing the decision points for corn and soybean producers in the 2014 Farm Bill. 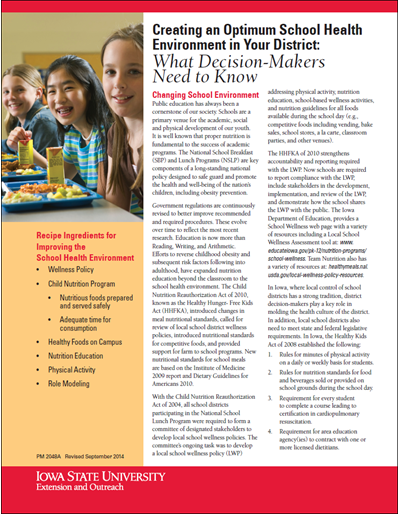 This publication addresses the changing school environment; school meal requirements and goals, nutrition education and physical activity. The default zoom and pan features are quite different between ArcMap and other applications such as Google Maps and Google Earth. This can make workflow, at the very least, annoying, but options can be changed within ArcMap for similar zoom and pan features that may allow improved productivity when using multiple programs. 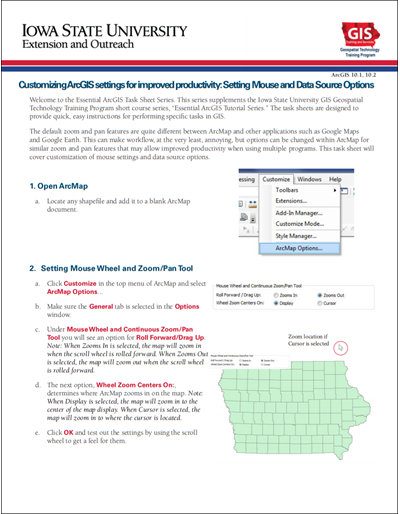 This task sheet will cover customization of mouse settings and data source options. Geocoding is the process of converting addresses or other identifiers (cities, postal codes) to x, y coordinates on a map. This task is pretty easy and straight forward when using a robust locator. 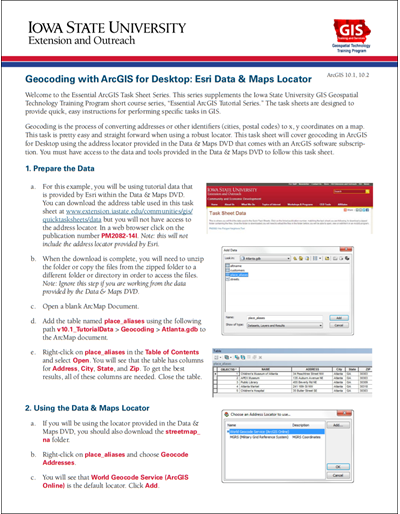 This task sheet will cover geocoding in ArcGIS for Desktop using the address locator provided in the Data & Maps DVD that comes with an ArcGIS software subscription. You must have access to the data and tools provided in the Data & Maps DVD to follow this task sheet. 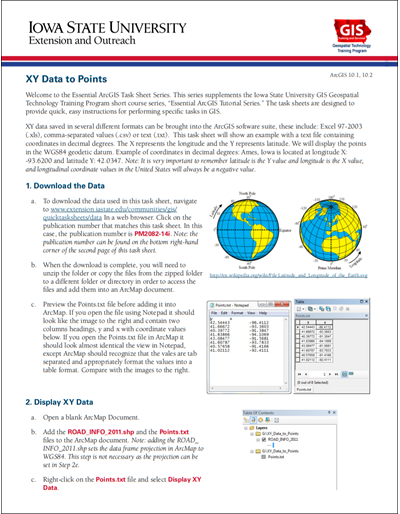 XY data saved in several different formats can be brought into the ArcGIS software suite, these include: Excel 97-2003 (.xls), comma-separated values (.csv) or text (.txt). 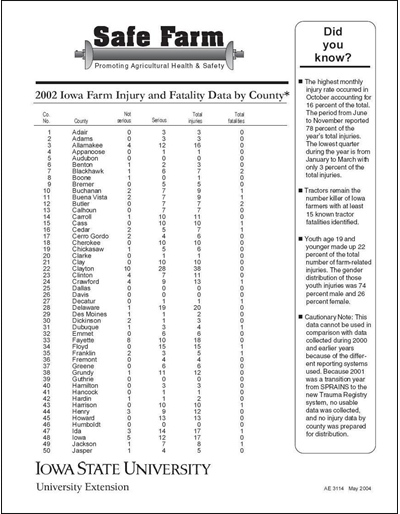 This task sheet will show an example with a text file containing coordinates in decimal degrees. 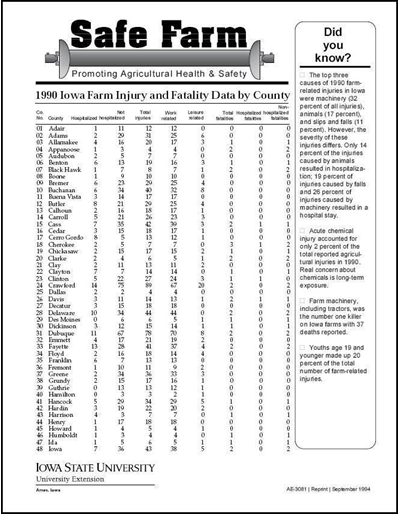 The X represents the longitude and the Y represents latitude. 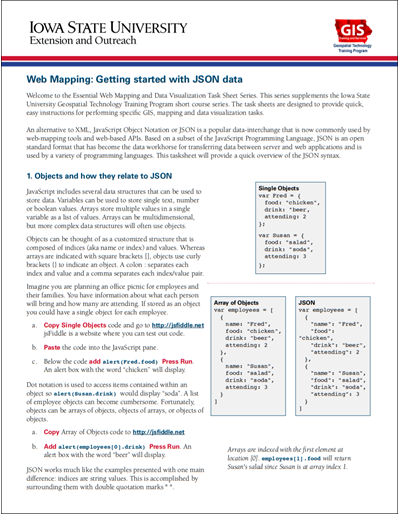 This task sheet will provide a quick overview of the JSON syntax. 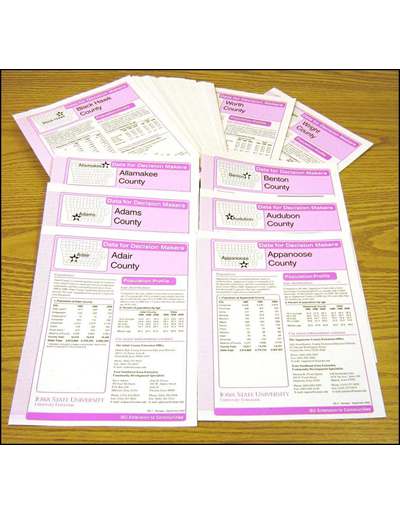 A map book is a collection of maps and text that belong in a series. 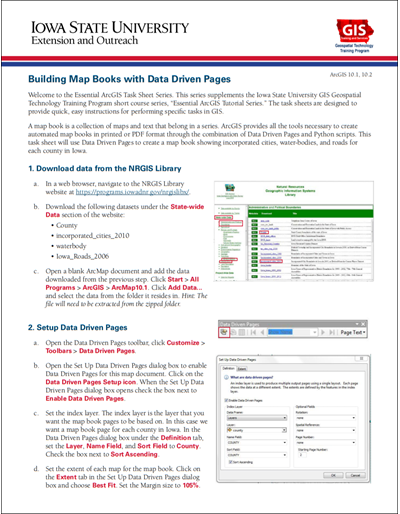 ArcGIS provides all the tools necessary to create automated map books in printed or PDF format through the combination of Data Driven Pages and Python scripts. 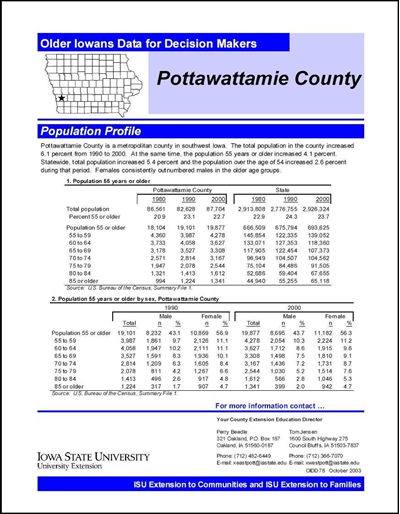 This task sheet will use Data Driven Pages to create a map book showing incorporated cities, water-bodies, and roads for each county in Iowa. 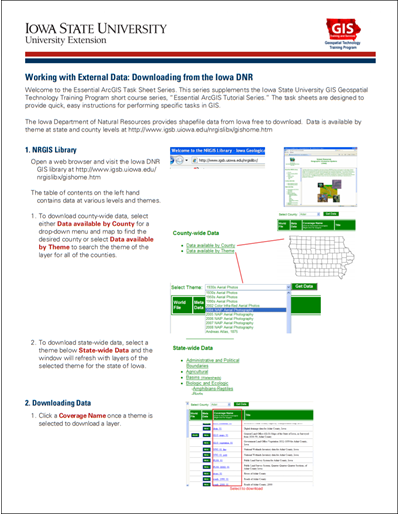 To add shapefiles for this task sheet, download a sample file from the NRGIS web site by consulting task sheet PM2082-09Q regarding downloading from the Iowa DNR. 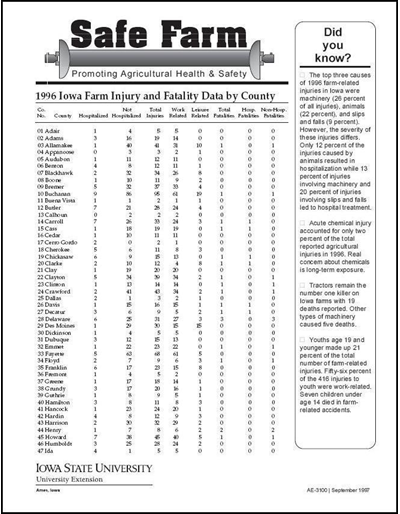 The Iowa Department of Natural Resources provides shapefile data from Iowa free to download. 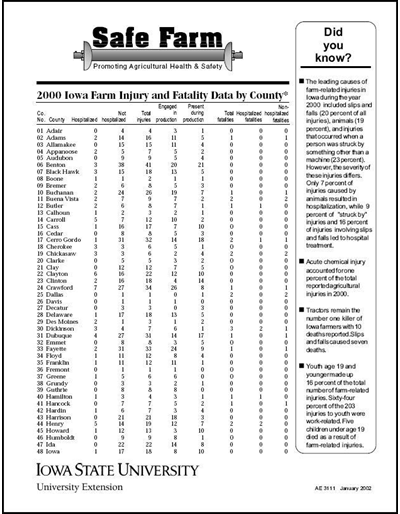 Data is available by theme at state and county levels at: www.igsb.uiowa.edu/nrgislibx/gishome.htm. 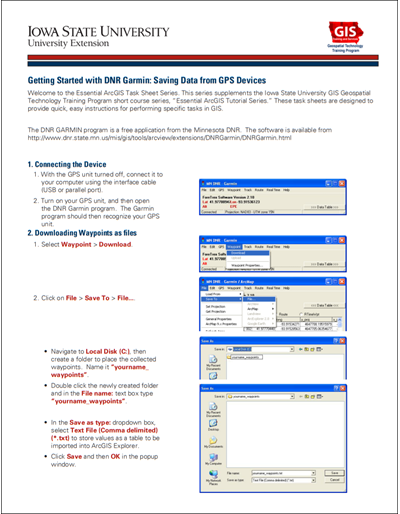 A KML file is a Google Earth format which is supported by servered mapping applications including Google Maps, a free online resource from Google which allows for personalized maps and sharing of spatial data. 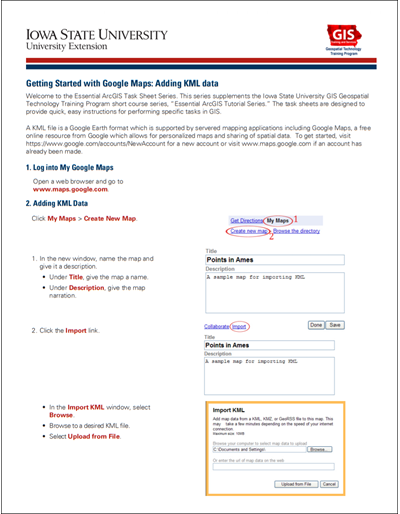 To get started, visit: www.google.com/accounts/NewAccount for a new account or visit: www.google.com/maps if an account has already been made. 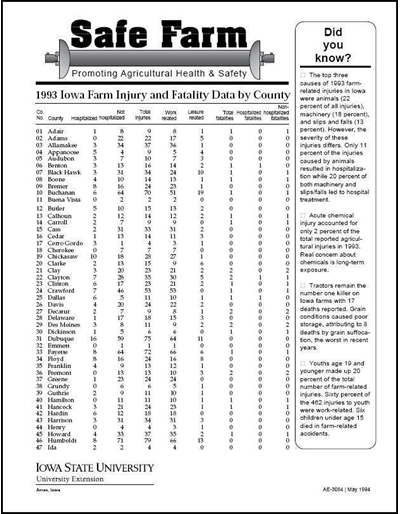 This worksheet provides guidelines for using the computer program RUSLE2 (Revised Universal Soil Loss Equation 2) and for calculating the Iowa Phosphorous Index. 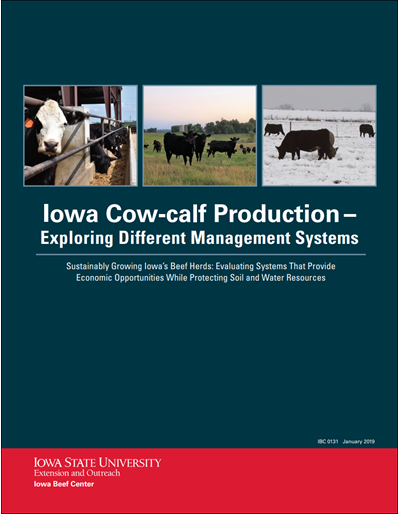 These are needed in nutrient management and conservation planning. 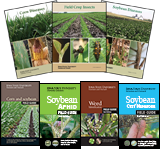 Information on moisture basis conversations, which are purely mathematical adjustments that don't change the fundamental quality of the grain. 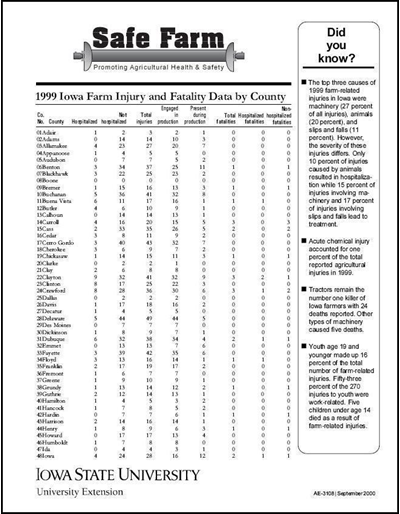 Data for Decision Makers reports can be generated by visiting the ISU Extension and Outreach Indicators Portal.